You are on Stadium Tour Information. Skip to the next section. 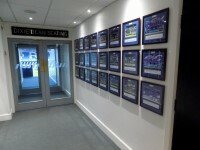 Stadium tours run every day from 10:00, subject to pre-organised events. The tours last approximately 60 minutes. The last tour of the day is at 14:30 and is subject to availability. 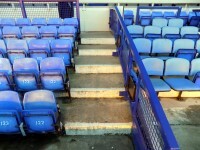 The main stadium tour encompasses a number of steps along its route; this will not be suitable for wheelchair users. This access guide provides information about the accessible tour route. Bookings are available on the day, but it is strongly advised to book in advance. 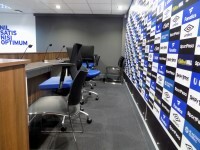 Supporters with disabilities are advised to email details of any special requirements or assistance they may need ahead of their specified tour date - eteam@evertonfc.com. There is no charge for carers. There are accessible toilets and standard toilets located along the tour route if required. The tour guide can provide assistance with all doors along the route. 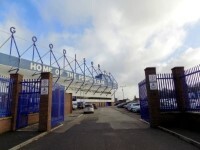 Everton stadium tours do not operate on a home matchday and only Legends Tours operate the day before a first-team home fixture. 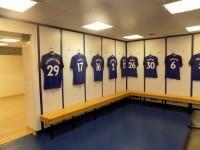 The Legends Tour is hosted by former player Mark Higgins who will be joined by two Everton Legends at every tour. 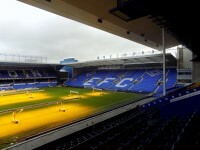 Please arrive no earlier than 15 minutes before the start of your tour at Goodison Road Reception. Upon entry to the stadium you will be required to take part in a body scan and any bags will be searched for security and safety reasons. 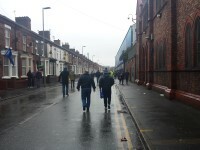 You are on Getting to Goodison Park. Skip to the next section. 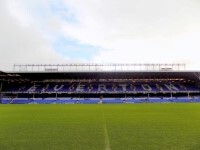 For more information on getting to Goodison Park, the help and assistance available at the stadium and additional contact information please click here (new tab). You are on Stadium Tour Parking. Skip to the next section. Stadium tour parking is located in the main car park in front of the Sir Philip Carter Park Stand. 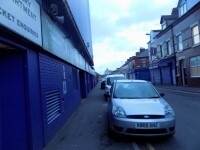 The car park is accessed via Goodison Avenue. There are 3 Blue Badge bays available in the car park. 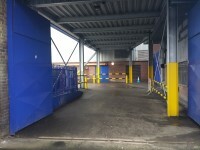 The dimensions of the Blue Badge bays are 360cm x 620cm. For more information on car parking and drop off points please click here (new tab). There is step-free access throughout the outer concourse. The surface of the outer concourse is tarmac. 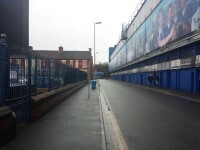 The outer concourse includes Goodison Road, Gwladys Street and Bullens Road. 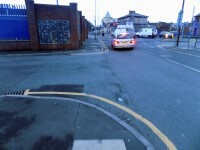 There are dropped kerbs from the roads to the outer concourse path. There are food and drink stands located around the outer concourse. 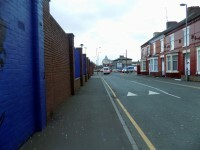 There is a large screen located on Bullens Road displaying highlights of Everton matches. 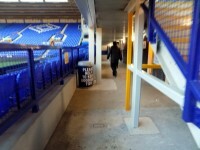 There is step-free access to all stands from the outer concourse. 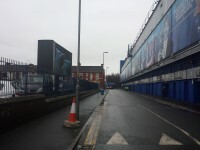 The roads immediately surrounding Goodison Park are closed 2 hours before kick-off with the exception of residents and car park pass holders only. A full road closure will be in place 45 minutes before kick-off. The road closure will begin again shortly before the final whistle and remain in place for 15-20 minutes, depending on crowd density. 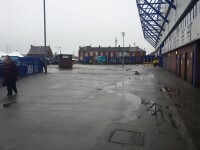 For more information on the Bullens Road Stand - Paddock and Lower Tier please click here - (new tab). 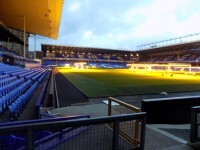 For more information on the Bullens Road Stand - Upper Tier please click here - (new tab). For more information on the Bullens Road Stand Away Supporters - Paddock and Lower Tier please click here - (new tab). For more information on the Bullens Road Stand Away Supporters - Upper Tier please click here - (new tab). 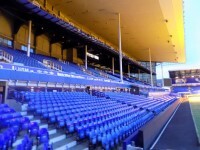 For more information on the Howard Kendall Gwladys Street End - Lower Tier please click here - (new tab). 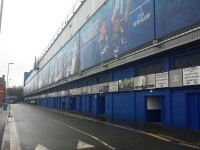 For more information on the Howard Kendall Gwladys Street End - Upper Tier please click here - (new tab). For more information on the Main Stand - Family Section North please click here - (new tab). For more information on the Main Stand - Family Section South please click here - (new tab). For more information on the Main Stand - Middle Tier please click here - (new tab). 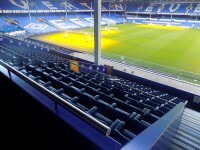 For more information on the Main Stand - Top Balcony please click here - (new tab). For more information on the Sir Philip Carter Park Stand please click here - (new tab). For more information on the Sir Philip Carter Stand - Accessible Platform please click here - (new tab). 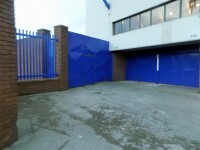 For more information on the Everton One shop please click here - (new tab). 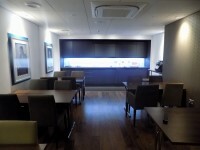 For more information on the Toffee Shop please click here - (new tab). 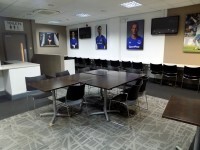 For more information on Main Stand - Goodison Road Reception, Sponsors Lounge and Dixie Dean Suite please click here - (new tab). 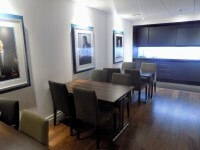 For more information on the Main Stand - 85' Lounge and Brian Labone Suite please click here - (new tab). 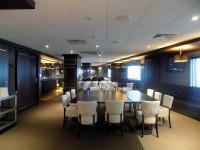 For more information on the Main Stand - 1878 Brassiere Suite please click here - (new tab). For more information on the Main Stand - Joe Mercer Suite and Alex Young Suite please click here - (new tab). 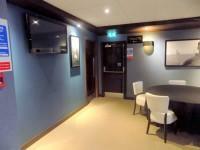 For more information on the Main Stand - Pitchside Executive Boxes please click here - (new tab). For more information on the Sir Philip Carter Park Stand - Hospitality please click here - (new tab). For more information on the Stadium Tour please click here - (new tab). 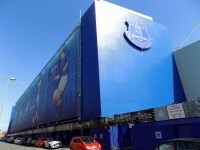 For more information on the Everton Matchday Hub please click here - (new tab). For more information on the Peoples Hub please click here - (new tab). For more information on the Fan Zone please click here - (new tab). 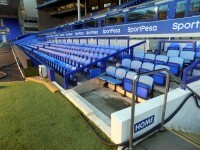 For more information on thehttps://www.disabledgo.com/access-guide/everton-football-club/blue-base please click here - (new tab). 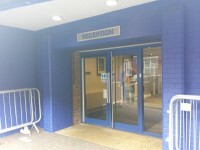 You are on Outside Access (Goodison Road Reception). Skip to the next section. 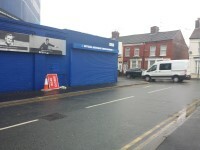 This information is for the entrance located on Goodison Road. The reception point is located to the right as you enter. The reception point is approximately 1m (3ft 3in) from the entrance. 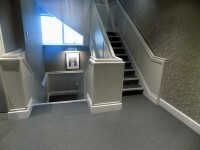 The type of flooring in the reception area is carpet and tiles. 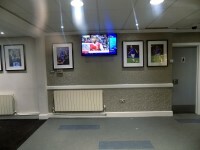 You are on Goodison Road Reception - Dixie Dean Suite. Skip to the next section. 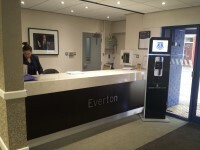 The tour begins in the Goodison Road reception area. 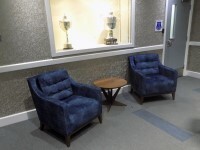 There is seating with armrests available in the reception area. From here the tour guide will lead the tour group to Level 2 via the lift. 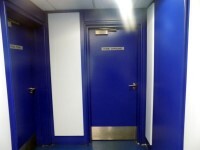 When exiting the lift, the tour leads along the ‘Walk of Fame’ corridor to the Dixie Dean Suite. The stairs are located on the main corridor, to the right of reception. 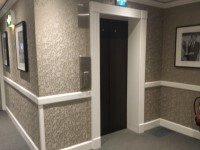 The lift is located to the right of reception. The dimensions of the lift are 170cm x 90cm (5ft 7in x 2ft 11in). You are on Dixie Dean Suite. Skip to the next section. 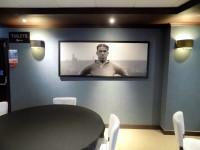 Within the Dixie Dean Suite the tour guide gives an introduction and talks about the Everton Legend ‘Dixie Dean’. 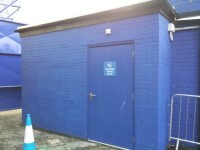 Standard toilets are located at the rear of the suite. 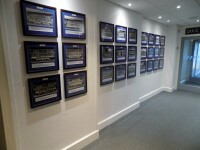 The tour then returns to the ‘Walk of Fame’ corridor. 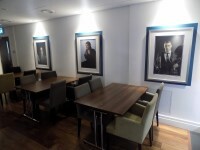 You are on Wall of Fame Corridor - Dixie Dean Seating Area. Skip to the next section. 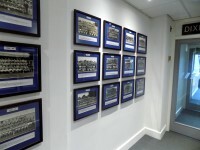 Back in the 'Wall of Fame' corridor, the tour guide gives a short talk about the team photographs. There is step-free access throughout this part of the tour. The tour group are then led through two sets of manual double doors. Both doors have an opening width of 140cm. The first set of doors open away from you and the second set of doors open towards you. 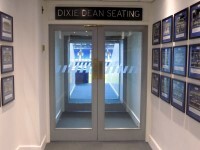 Once through the doors you are at the Dixie Dean seating area and Directors Box. At this point, the tour guide will give a talk about all four stands and where directors sit. This is an opportunity for visitors to take photographs of the stadium. The tour then returns to ground floor lobby via the lift. 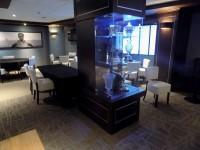 You are on Ground Floor Lobby - Players Lounge. Skip to the next section. 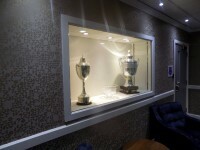 When in the lobby area the tour guide will give a brief talk about the trophies located here. From the lobby area the tour proceeds through a single door into a corridor. The door has an opening width of 75cm. 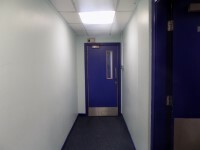 The flooring in corridor consists of carpet. At the end of the corridor the route passes through another single door, with an opening width of 76cm. 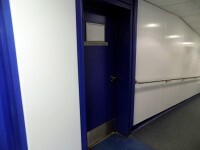 This door is used to access the top of the player’s tunnel. 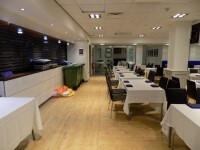 On the way to the changing rooms the tour takes a detour into the Players Lounge. 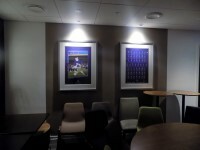 There are two sets of single doors leading to the Players Lounge. Both door openings are over 75cm. The flooring in the Players Lounge consists of vinyl. There is an opportunity to sit down here whilst the tour guide gives a short talk. 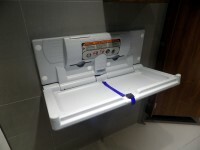 A standard toilet with baby changing facilities is available off the Players Lounge. The tour then returns to the main corridor. You are on Visitors Changing Room. Skip to the next section. From the main corridor the tour proceeds towards the changing rooms. 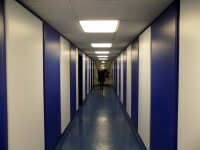 The corridor flooring consists of vinyl. At the end of the corridor the tour leads through a single door that opens away from you. The door has an opening width of 76cm. From here you will then enter the visitors changing rooms through another single door. The door has an opening width of 74cm. 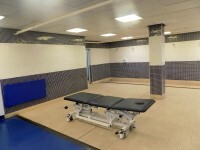 The flooring within the visitors changing room consists of vinyl. 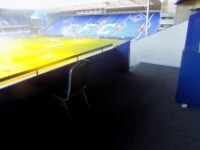 There is bench seating located around the edge of the changing room. At this point of the tour there is a short talk about the changing rooms. There is also an opportunity for visitors to take photographs. 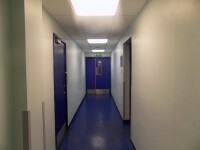 After the visitors changing room the tour moves back onto the main corridor and onto the home changing room. You are on Home Changing Room. Skip to the next section. The tour guide then leads the group to the home changing room. 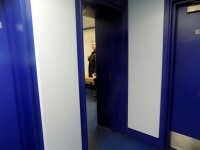 To enter the home changing room there are two sets of single doors. Both doors have an opening width of 76cm. 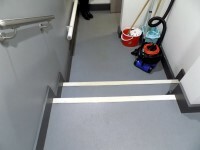 There is step-free access throughout the home changing room. 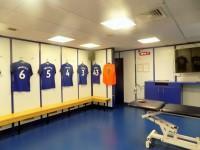 There are Everton shirts of the current squad hanging above the bench seating. After the changing room the tour moves back onto the main corridor. 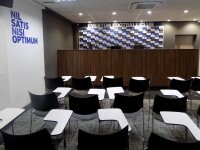 You are on Post Match Interview Area and Media Interview Room. Skip to the next section. From the main corridor the tour will continue to the media areas. 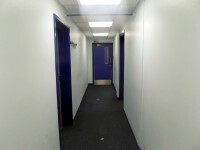 The surface of the corridor is vinyl. 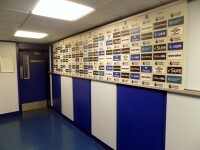 The tour initially stops at the Post Match Interview Area, which is located on the corridor. The tour guide explains that this is where the players are interviewed after the game. There is an opportunity to have your photo taken here. From the Post Match Interview Area the tour continues to the Media Interview Room. 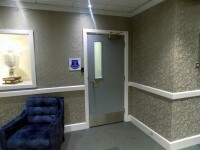 The door to the Media Interview Room opens away from you and has an opening width of 73cm. At this point of the tour there is a brief talk by the tour guide. There is an accessible toilet nearby, in the 1878 Brasserie. You are on Players Tunnel and Dugouts - Standard Tour. Skip to the next section. 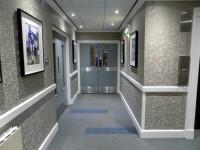 The tour then continues down the corridor towards the player’s tunnel. This section of the corridor has a steep slope. The slope has handrails both sides. 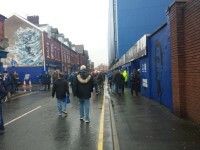 At the bottom of the slope is the entrance to the player’s tunnel. 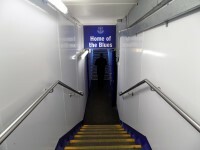 The players tunnel has 7 steps down and then 13 steps up towards pitchside. 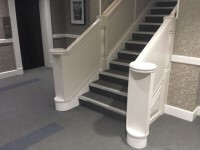 The steps are at a height of 16cm and have handrails on both sides. At this part of the tour, the ‘Z Cars’ theme tune is played. This tune is played when the Everton team walk out on matchdays. If noise is an issue, please inform the tour guide who can make sure the tune is not played. 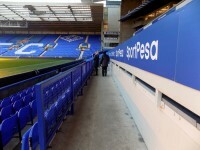 At the top of the steps you have reached pitchside and the dugouts. 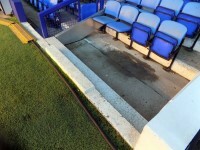 The surface at pitchside is astroturf. Caution should be taken due to cables running along the technical area. At pitchside the tour guide gives a talk about the stadium, the stands, the pitch, the executive boxes and the dugouts. There is an opportunity to take photographs of the stadium and the dugouts. There are 2 steps leading down to the home dugout. 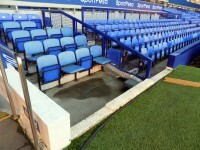 There is 1 step leading down to the away dugout. 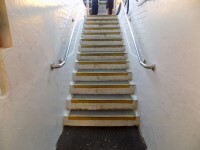 The steps are not clearly marked and do not have handrails. The surface of the dugouts is concrete. You are on Media Centre - Standard Tour. Skip to the next section. The tour then proceeds towards the Media Centre. From the dugouts the tour is led down 2 deep steps leading onto the Main Stand Paddocks. The steps are not clearly marked and there are no handrails. Immediately beyond these steps are an additional 5 medium height steps leading up to the rear of the Paddocks. The steps are clearly marked and have a handrail on the right (going up). Proceeding along the walkway, there are then 4 steps leading up to a narrow concourse. 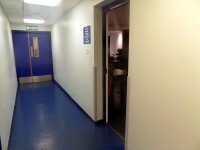 Off this concourse is a single door leading to the Media Centre. 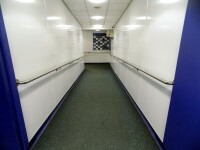 On this corridor there are 2 steps leading down to the Media Centre. The steps are clearly marked and have a handrail on the left (going down). 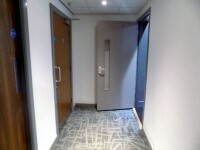 Access to the Media Centre is via a single door opening towards you. The flooring within the Media Centre is carpet. At the Media Centre there is a short talk from the tour guide. There is an opportunity to sit in the managers/coaches platform and take photographs. 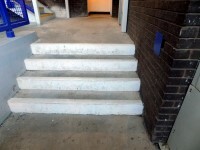 There are 3 medium height steps leading up to the managers/coaches platform. Visitors will be handed a certificate for attending the ‘Stadium Tour’. The tour is now finished and you return to the Main Stand reception. You are on Dugouts and Media Centre - Accessible Route. Skip to the next section. 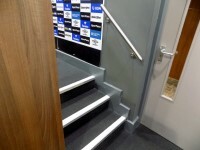 The following information is for the accessible route to the Media Centre, pitchside and the dugouts. This route has step-free access throughout. 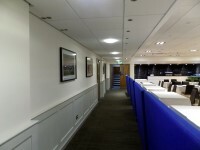 From the Main Stand main reception you are led through The ‘85 Lounge and 1878 Brasserie, along a corridor then into Media Centre. 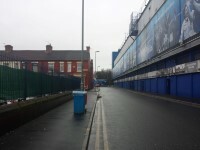 From the Media Centre continue out onto Goodison Road. 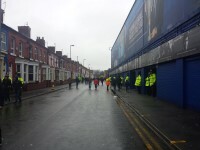 The tour leads along the pathway towards the Sir Philip Carter Park Stand. 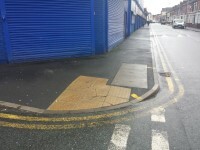 The pathway can narrow in places due to parked cars. 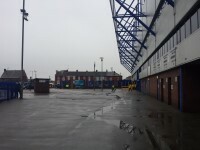 At the end of the pathway the tour turns left towards the Sir Philip Carter Park Stand. 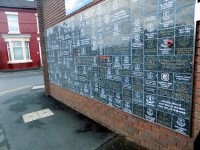 At this section of the route is the ‘Wall of Remembrance’. Proceeding towards the outer concourse you pass through a gate which is permanently open. 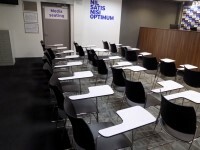 The gate has an opening width of 100cm. 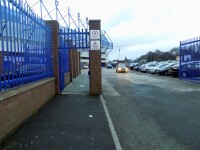 On the south-west corner of the Sir Philip Carter Park Stand is an accessible gate. 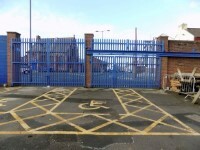 The accessible gate opens away from you and has an opening width of 100cm. 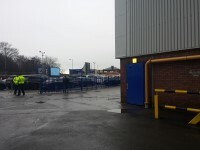 This gate leads you to an outer concourse area between the Sir Philip Carter Park Stand and the Main Stand. 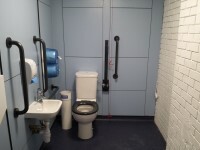 In this area are two accessible toilets and a changing places facility. From this outer concourse you proceed to pitchside. 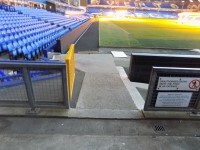 There is a slight ramp down to the Main Stand walkway (pitchside). 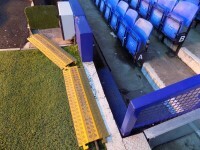 The surface of the pitchside walkway is condensed rubber. When reaching the dugouts the tour guide will give a short talk about the stadium, the stands, the pitch, the executive boxes and the dugouts. After completing this part of the route, the tour returns to the Media Centre. There is an accessible toilet nearby in the 1878 Brasserie Suite. You are on Accessible Toilet(s) (1878 Brassiere Suite - Level 0 (Ground Floor)). Skip to the next section. 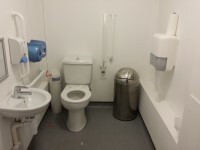 This accessible toilet is located at the rear of the 1878 Brassiere Suite. 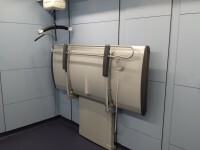 The dimensions of the accessible toilet are 140cm x 200cm (4ft 7in x 6ft 7in). The height of the soap dispenser is 100cm. 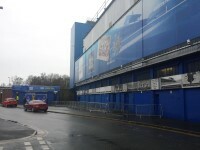 You are on Changing Places (Main Stand - Family Section South). Skip to the next section. The facility is located to the right when entering the main concourse. The key can be obtained from an accessibility steward. 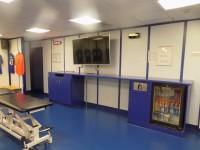 The dimensions of the facility are 310cm x 400cm. 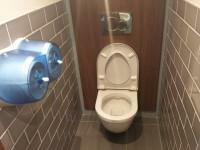 The transfer space on the left as you face the toilet is 70cm (2ft 4in). The colour contrast between the grab rail(s) and wall is good. 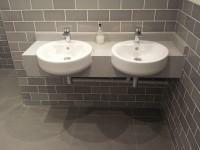 The height of the mirror is adjustable, depending on the height of the sink. 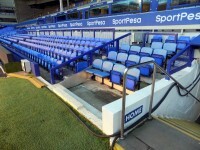 You are on Accessible Toilet(s) (Main Stand - Family Section South). Skip to the next section. 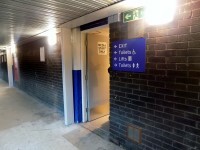 This accessible toilet is located to the left along the main concourse. 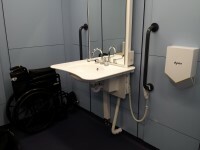 The dimensions of the accessible toilet are 154cm x 255cm (5ft 1in x 8ft 4in). 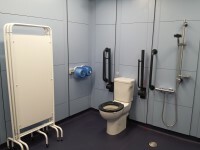 There is a similar accessible toilet available with the lateral transfer space on the left.